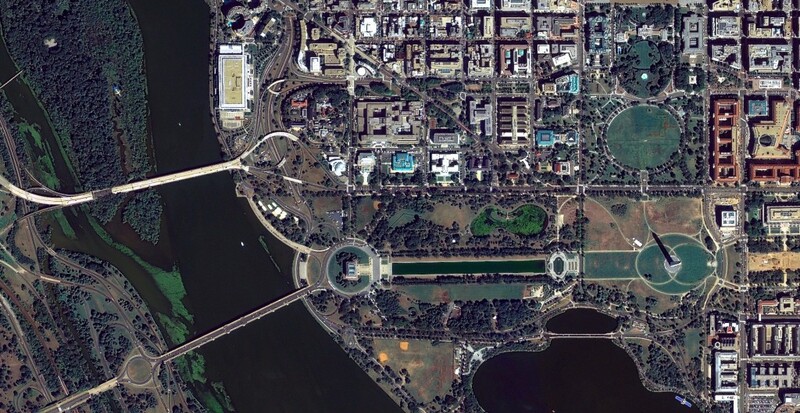 Forget the red, white and blue — Washington, D.C. has been looking mighty green for years. In fact, the U.S. capital is on a mission to be the greenest city in the nation, and part of that green initiative involves turning building roofs into green space. 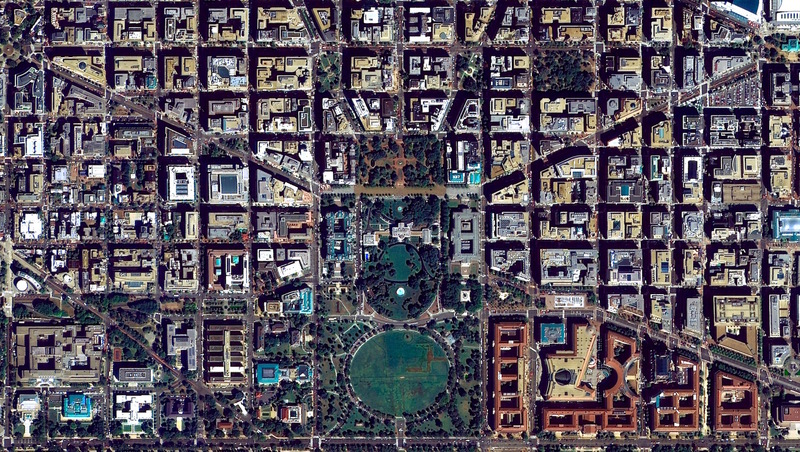 Washington, D.C. captured from UrtheCast’s Deimos-2 satellite. 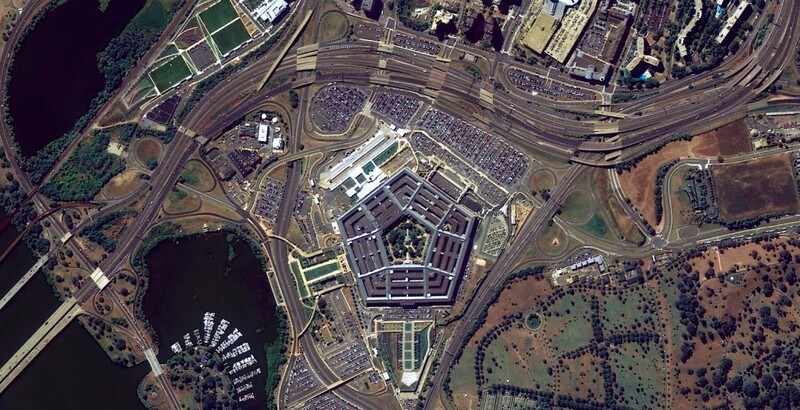 The U.S. Capital Building is located at the top, and the Thomas P. O’Neill Jr. Federal Building is magnified, showing 15,500 square feet of green roof space. The Washington D.C. Metropolitan Region installed the most green roofs on the continent in 2015, nearly 1.6-million square feet, with Toronto, Ontario, coming in second place with nearly 600,000 square feet, according to the annual Green Roof Industry Survey produced by Green Roofs for Healthy Cities (GRHC), a Toronto-based green roof and wall industry association. 2015 marked the fifth time Washington D.C. has claimed the top spot for green roofs. Washington has adopted public policies and programs to support green roof investment, such as rebates of up to $15 per square foot for each green roof installed and also offers credits to reduce stormwater fees. “It comes as no surprise that the top-performing regions are those that invest directly and indirectly in green roof infrastructure projects to create green space, mitigate stormwater run-off, improve air quality and moderate the urban heat island effect,” said GRHC founder and president Steven Peck. The urban heat island effect is a result of a city being significantly warmer than its surrounding rural areas due to human activities and modified land surfaces, which use materials that store short-wave radiation. Green roofs and the use of lighter-coloured surfaces in urban areas, which reflect sunlight and absorb less heat, may help mitigate this effect and act as insulators to reduce a building’s cooling and heating energy needs. According to a recent report released by the American Council for an Energy-Efficient Economy (ACEEE), Washington DC also ranked third place after Boston and New York City on the Biennial Energy Efficiency Scorecard, which measures innovative steps taken to lower energy costs for consumers and businesses and reduce pollution. DC placed high in energy efficiency categories for buildings and transportation. As part of another initiative to protect the environment, the National Capital Planning Commission is also participating in Target Cities, a two-year partnership of nine development projects across seven North American cities designed to amplify and accelerate district-scale community sustainability and create replicable models for next-generation urban revitalization. Washington’s Southwest Ecodistrict was one of nine projects chosen. The SW Ecodistrict Plan is a comprehensive and forward-looking approach to transforming a 110-acre federal precinct located south of the National Mall into a highly sustainable workplace and livable neighborhood. Implementing district-scale approaches for this area could enable the addition of four million square feet of office space while reducing greenhouse gases by half. In addition to the SW Ecodistrict, two other projects in Washington, DC were selected—the DowntownDC Ecodistrict and the St. Elizabeths-Congress Heights Ecodistrict.